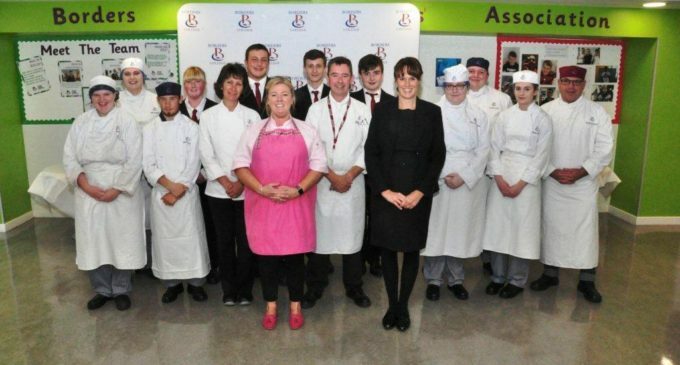 Borders College in Galashiels hosted its inaugural Local Food on Local Plates event earlier this week. Focusing on the best of what the area has to offer, the event took place during Scottish Food and Drink Fortnight in support of the Year of Young People. Supported by attendees from within and outwith the college, the event featured chef demos, a charity dinner and a food fayre which showcased 16 local suppliers and products including homemade liqueurs, fresh fruit, baked goods and locally distilled gin. Several stood out; establishing the Thomas and Ethel Bakery after studying catering and hospitality at Borders College, Tegan Thomas specialises in allergy-safe products. Set up in 2015, the company aims to supply Morrisons Supermarkets and have already been named runner-up wholesale bakery in The Scottish Food Awards earlier this year. And Tilly Fuller, general manager at Borderfields Oils, spoke of her aim to maintain a local connection for the company which was founded in Coldstream and now has its head office in Nottingham: ‘People like the fact our product is local, but it’s also available to buy from the supermarket,’ she said. Other exhibitors included Freewheelin’ Brewery, Ooft! Hot Sauce and the Borders Distillery in Hawick. 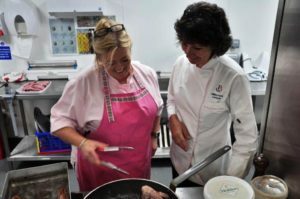 Meanwhile, professional chef demonstrations featured legendary chef Jacqueline O’Donnell (pictured left, in pink), Firebrick’s Amanda Jordan and a joint demonstration by Melrose-based Jonny Millar and Craig Gibb. Monies raised went to the Hospitality Industry Trust (HIT) Scotland to support to a number of Borders College staff and students through craft scholarships. Chief Executive David Cochrane spoke of the challenges of recruiting and the essential practice of attracting people to the industry by showcasing the available opportunities. 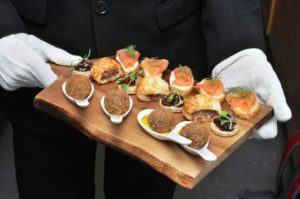 And Will Haegeland, deputy general manager of Cringletie House Hotel near Peebles, added: ‘Food and tourism are key growth sectors in the Scottish Borders and there aren’t many others. It is anticipated that the event will become an annual fixture in the Borders College calendar.